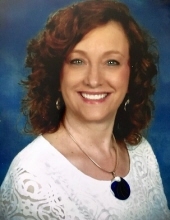 Cindy Walding Underwood passed on Tuesday, April 2, 2019, following a nearly four-year battle against advanced ovarian cancer, which she fought with all her effort while holding fast to a faith in God that never wavered. Cindy is preceded in death by her father, Thomas Franklin Walding, and survived by her mother, Lois Walding Pippin, (Ozark, AL). She is survived by her precious husband of more than 34 years, Tim Underwood (Tucker, GA), son, Jared Underwood (Tucker, GA), daughter Katie (Will) Marshall (Smyrna, GA), and the light of her last three years, grandson Jackson Marshall (Smyrna, GA). Cindy is also survived by siblings Susan (Kevin) Norman (Selma, AL), Tommy Walding, and Bill (Melissa) Walding (Ariton, AL), as well as many nieces and nephews. Growing up in Ozark, AL, Cindy enjoyed playing outside, riding her horse, taking care of animals, and bossing her younger siblings around. She graduated from Samford University in Birmingham, AL, where she met Tim their freshman year. Cindy and Tim were married in 1985, and moved from Birmingham to Tucker, GA, in 1987, where they welcomed their first child, Jared, soon after moving, and daughter, Katie, one year later. Cindy was an accomplished marketing sales and recruitment professional in Atlanta, GA, serving on the board of the American Marketing Association Atlanta chapter, and eventually starting her own firm. She was a longtime member of Briarlake Baptist Church, where she volunteered in many roles in children and student ministries and missions. Cindy also loved to travel and see new parts of the world with her husband and family. Cindy’s philanthropic spirit was evidenced by her love for helping others in her personal relationships, career roles, and ministry opportunities. She never met a stranger and would often leave the grocery store with a new friend’s life story and their requests added to her prayer list. She will be deeply missed by her friends, family, and all who knew her. Cindy was a devoted wife, an incredible mother, a precious daughter, a treasured sister, and a cherished friend, but her most recent title was one she especially delighted in—Jackson’s Mimi. She loved to read books, play chase, and share giggles with Jackson. The family will receive friends on Saturday, April 6, from 10:00-11:30am in the Sanctuary of Briarlake Baptist Church, 3715 Lavista Road, Decatur, GA 30033. Funeral services will begin at 12:00pm, with a Celebration Lunch at 1:00pm. A 3:00pm graveside service at Floral Hills Memory Gardens, 3000 Lawrenceville Highway, Tucker, GA 30084, for family and friends will follow. The family would like to express gratitude for the many groups at Emory Healthcare for walking alongside through this long fight against cancer. In lieu of flowers, donations may be made in Cindy’s memory to Briarlake Baptist Church. To send flowers or a remembrance gift to the family of Cindy Leigh Walding Underwood, please visit our Tribute Store. Family to have a luncheon after the service before going to the cemetery. Meet at cemetery after luncheon. "Email Address" would like to share the life celebration of Cindy Leigh Walding Underwood. Click on the "link" to go to share a favorite memory or leave a condolence message for the family.